Admittedly, the Saturday of this years Tramlines' was the day I'd most been looking forward to; mainly because my three ultimate favourite bands, aka October Drift, Judas and The Doldrums, were all scheduled to play and surprisingly none of them clashed! There's nothing worse than clashes when it comes to festivals. Unfortunately due to illness Judas had to pull out, but I still had an absolutely fantastic, albeit exhausting, day. My first band of the day were Birmingham based guitar thrashing quartet Juice, who I've been wanting to see for AGES. I first discovered their music through Soundcloud when their rip-roaring track Acid Kids came on randomly after I'd been listening to another track. They kicked off their Tramlines set with this very song, and I loved every minute. 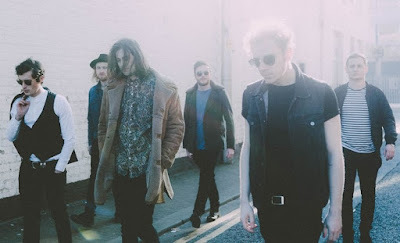 Forthcoming single Angel Of The Azure is a surge of melodic brilliance and definitely seals their place as one of the most promising young up and coming bands in the country. The highlight of their set for me was the explosive yet delightfully hazy Sugar, which was their debut release last year. This band were an accidental find for me, but I'm so glad it happened as they're fast becoming one of my favourite new bands- even more so now that I've seen them live. KONG, who I caught at Crystal on Saturday afternoon, certainly know how to put on an exciting live show. I find this band somewhat intriguing; their sound is a mixture of indie-rock and punk, which definitely works for them and sets them apart from the sea of up and coming bands emerging from Sheffield at the moment. Assertive, gritty vocals and extraordinarily powerful, scintillatingly addictive guitars make for a raw and all around impressive performance which I really enjoyed. I first discovered White Room a few weeks ago when they played for This Feeling in Leeds, and I was completely blown away by their dynamic and coherent live show. The band hail from Brighton, and have a delightfully raucous and diverse sound, which I think is heavily reminiscent of the 90's Britpop era. From start to finish, their set is shimmering, energetic and full of confidence with just the right amount of swagger. White Room have already caught the eye of music legend Paul Weller, and it's easy to see why; their set is filled with ready made hits, my favourite being their most recent release, the wonderfully psychedelic 'Think Too Much'. I always look forward to seeing The Doldrums live; they're one of my favourite bands, and are such a hardworking group of lads with a real knack for providing a pitch perfect, audacious live show. After having seen them perform a number of times over the last few months I now feel quite familiar with their new music, and it makes me seriously excited for their forthcoming second EP. The band soared seamlessly through their set at West Street Ale House, which was comprised of songs both old and new; from the infectious hooks of the addictively catchy 'Chinese Chip Shop' to the all but delicious 'Smoke Rings and Wolfbites', their performance is a high powered frenzy of excitement and I never wanted it to end. One of the most interesting things about this band is the shared frontman duties between Ollie Trevers and Josh Langley; this provides a real musical diversity, as no one song is ever the same. When I arrived back at Crystal Bar, excitement and anticipation had reached fever pitch leading up to October Drift taking to the stage. It was great to see the place so full, and to see so many familiar faces all of whom were so visibly looking forward to the performance ahead. Where do I even begin when talking about this band... I don't think I could ever really put into words how I feel about them; I have a real soft spot for them, and anyone who knows me well will have no doubt had to put up with me constantly raving about how good they are. There's something so inexplicably special about them, and if you haven't already, then get to one of their shows... you'll understand exactly what I mean when you do. Their live shows are always incredibly energetic, with each member of the band giving their all as if this is their last ever performance and they have to make it as grand and memorable as is possible. Everything they do is done with complete passion, exhultation and the upmost enthusiasm; October Drift truly are in a class of their own, and I couldn't have wished for a better way to end Day 2 of my Tramlines weekend. The final part of my Tramlines diary will be up in the next couple of days. Tramlines is that one beautiful time of year where we can all forget about all of our worries and just relax and enjoy three carefree days of fantastic live music. I've been a little stressed out of late what with one thing or another, so I vowed to myself that I'd basically let all of that go, have a drink and a dance and enjoy the weekend alongside some pretty wonderful friends and some of my favourite bands. This was my third time attending the festival, and I enjoy it more and more each year as I venture out and discover some of the hidden gems that are Sheffields' music venues. Once again I spent most of my weekend at Crystal Bar, which as per usual boasted an absolutely brilliant line up courtesy of Aggresive Management, but I also spent quite a lot of time at Tiger Works Bar on West Street and also at The Rocking Chair- both of which are seriously impressive little venues and hosted some great up and coming bands over the three days. My Tramlines started on Friday evening at Tiger Works with Liverpools' very own rock powerhouse, aka The Jackobins. I've been looking forward to seeing these guys again for quite some time, especially after having recently heard how brilliant their new music is. 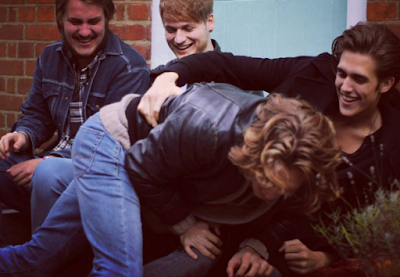 I wrote about their new single Hasty last week, and you can read that here. I've pretty much had that on repeat since it was released on Friday. Suffice to say my weekend could not have gotten off to a better start; there's something about this band that just draws me in. I've been aware of them for a couple of years now, but it's only recently that I've really started to get into their music. In terms of stage presence, they're one of the most impressive bands I've seen live to date. Frontman Dominic oozes confidence and star quality; it's difficult not to be taken aback by how powerful his vocals are. 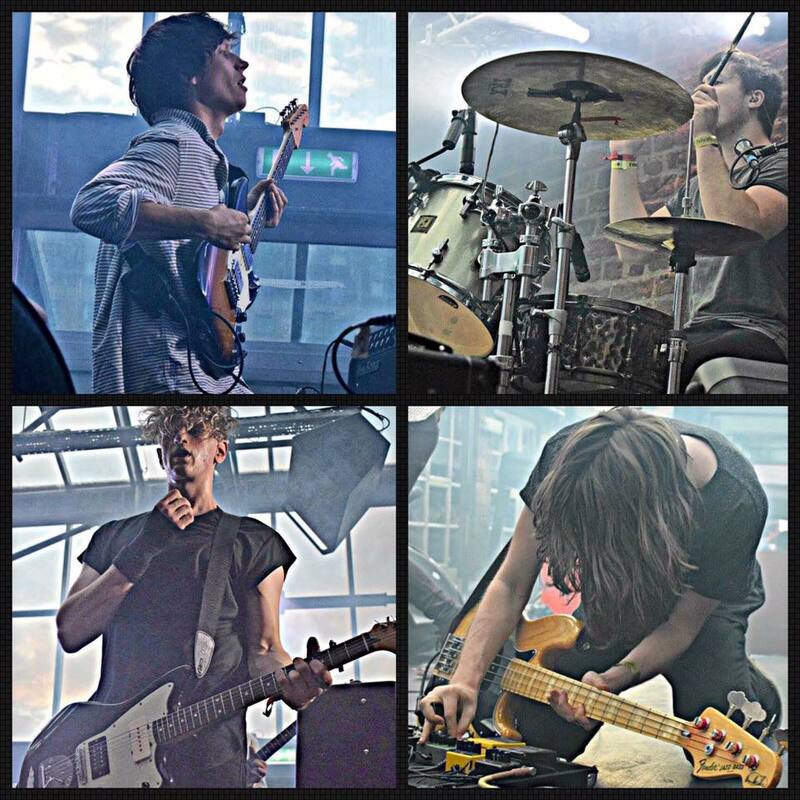 I don't think it'll be long now before these boys leave the small, intimate venues behind in favour of bigger stages and bigger audiences- they already have a large and incredibly loyal fanbase, as I've noticed both times I've seen them live. They have a huge sound, and are such energetic and tenacious performers. As soon as The Jackobins ended their set, I hotfooted it down to Crystal Bar to catch one of my favourite artists, Conor Houston. Having arrived a little late, he was already on stage when I got in but I somehow managed to squeeze my way through the crowds to steal a front row spot for the rest of his set. It's the second time I've seen him perform with a full band, and as wonderful as his music sounds when played acoustically, there's something very special about seeing him live like this and I think the particularly big, glam-rock tracks within his set such as The International and Retro Tinted Mind benefit from being played live in this way. Conor is most definitely one of the most talented and creative people I know, and from speaking to people in the crowd after his set I think everyone feels much the same way. He has such an artistic flair and is an incredibly skilled songwriter. The standout performances for me were The Best Strangers In The World, which has long since been my favourite of his tracks, and the incredibly catchy Champagne Eyes. It was great to see so many people crammed into the venue to watch Conor, and he was clearly in his element that night. Liverpool six piece The Jackobins have been on my radar for a year or so now ever since I managed to catch them live for the first time around this time last year at Tramlines festival in Sheffield, and suffice to say they definitely lived up to the hype surrounding them and their music. With their big sound and even bigger stage presence, it was difficult not to be impressed. New single Hasty is a full on, anthemic, atmospheric rock number complete with dynamic instrumentation and slick, powerful vocals from frontman Dominic. The lyrics are honest, raw and delivered well and with with complete conviction. I don't hesitate in saying that this is definitely one of the best tracks I've heard so far this year. The Shantics are a high energy London based four piece comprised of brothers Jimmy and Harry Morris, Rob Wheeler and Nubby Vine. The band have been playing together for a year or so, but "Maybe I..." is their first official release. With its' catchy hooks and their unwavering consistency as musicians, I think they're definitely ones to watch in the very near future and could quite well find themselves the name on everyones' lips in the months and years to come. There already seems to be a bit of a buzz surrounding them, which is exciting indeed for a band who are just coming out with their first single.